When do you need consulting services? Consulting services are paid services that are rendered by an expert who is knowledgeable in a certain field to a third party entity. If your business needs professional advice regarding something, looking for a consultant who can help you is one of the steps that you can take. You can learn how to write a consulting services agreement by simply following steps we have provided below. Sample consulting services are also provided to serve as your reference. 2. Use a suitable template for the transaction. 3. Edit or make changes to the template. A consultant is the person you turn to to get expert advice on matters related to business, management, law, export, security, education, finance, and other specialized field. Before getting consulting services, consultants are most likely to explain the terms and conditions of using the services they offer through a consulting services agreement. 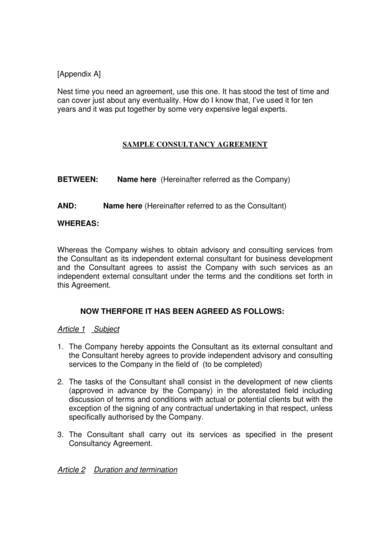 Here are the steps that will help you write a consulting services agreement for your consulting business. Gather the correct names, address and contact numbers of the entities who will take part in the agreement. Make sure to clearly distinguish who the consultant and the client is. Using a consulting template is the easiest and most convenient way to write a consulting agreement. You may also use various agreement samples and templates if you prefer writing your agreement from scratch. Some of the samples that you can use as guide are sample independent consulting agreements and consulting contract templates. Choose a template that can be easily edited and make changes to it to so that it will be appropriate for the type of transaction you are doing. Always proofread your work and check for spelling and grammar errors. Since you are also making changes to the actual document, check the coherence of the sentences and paragraphs and see if the entire content is still related. When you need expert advice regarding export purchases, then you can definitely use the export consulting services agreement sample. The agreement specifies who the two parties are in the agreement. Every section of the agreement is numbered and put in separate rows so that it will look organize. It is also easy to find and read certain sections with this type of layout. 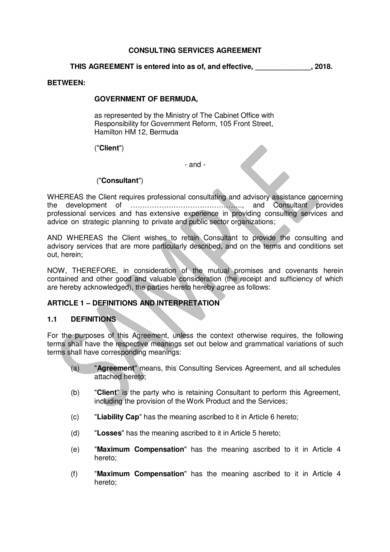 The professional consulting services agreement sample describes the parties involved as the client and consultant. It has a whole section dedicated to the definition and interpretation of terms as used in the agreement. The sample is detailed and includes sections that define not only the entire agreement but also the extended meanings, standard of care, fees, estimates and costs, limitations on liabilities, etc. 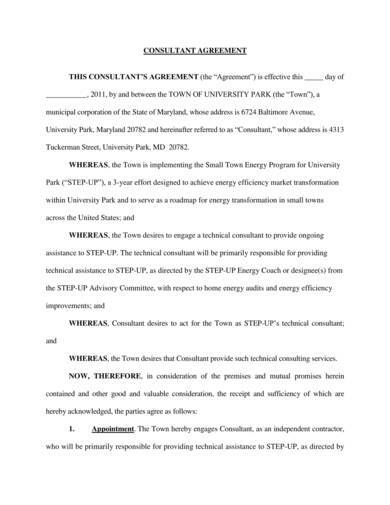 This is a sample consulting agreement used in the state of Maryland. 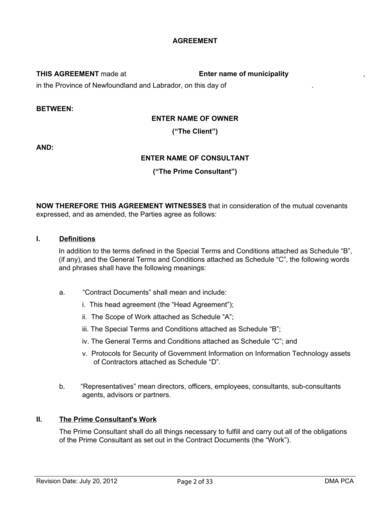 The agreement uses a generic layout, and the terms and conditions are numbered, underlined, and written in bold. On the last page, you can find spaces provided for both the parties to write their names and affix their signatures on. 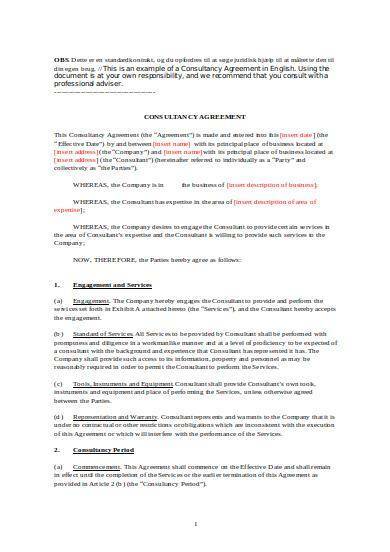 Use this editable consulting services agreement sample if you want a template that you can easily and conveniently edit for your own use. Since the sample is available in Word, you will surely breeze through the document and turn it as your own. Places where you will need to insert the required information and the instructions on what to put are written in red so its easier to complete the document. 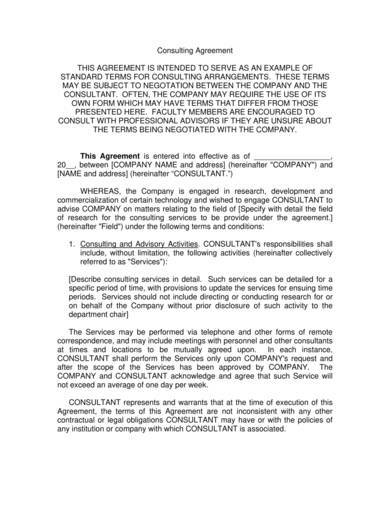 Another consulting agreement sample template that you can edit and use is the industry-academic consulting services agreement sample. It is also available in Word so making changes to it will be a breeze. It provides a definition and scope of the consulting services to be provided and other terms and conditions, like compensation and reimbursement, indemnification, intellectual property, confidential information, etc. Instructions on how to use the agreement is provided at the very start of the document. 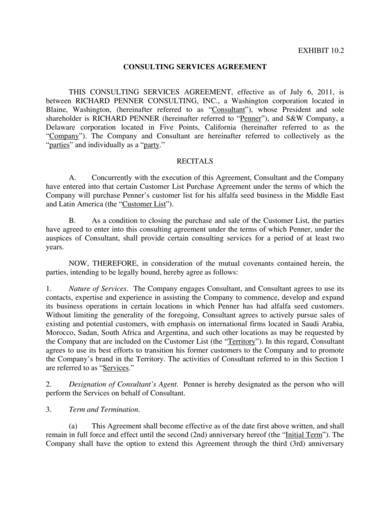 It states that the agreement is intended as an example of standard terms for agreements in consulting. It follows a generic layout with numbered sections. Important details are written in bold and capitalized so that they can be noticed easily. You can create a professionally looking and legally binding agreement with the use of this consulting services agreement sample. The sample is available in PDF and it includes terms and conditions, like engagement, services, term and termination, compensation, performance and scope, etc. 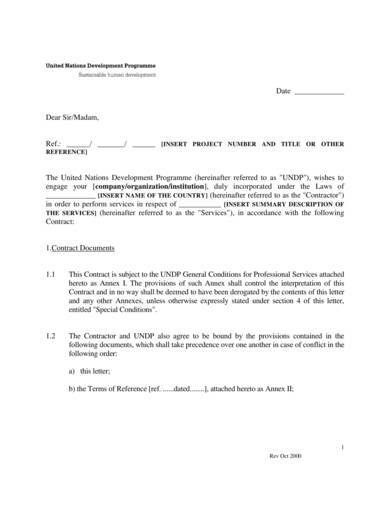 This consulting services model agreement sample is approved and used by the United Nations Development Programme or UNDP. The agreement is written like that of a letter where the UNDP expresses their wish to engage a certain company or entity in certain consulting services. The contract terms and conditions are written after the letter. 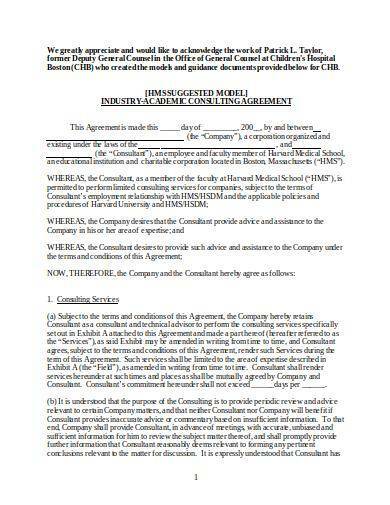 Create a reliable and legally binding agreement with the use of this printable consulting services agreement sample. The layout is simple and the signature page is provided at the last part of the agreement. A good consulting agreement is created by good legal mind. If you want to make that kind of agreement then you will need a good sample like the standard consulting services agreement sample. 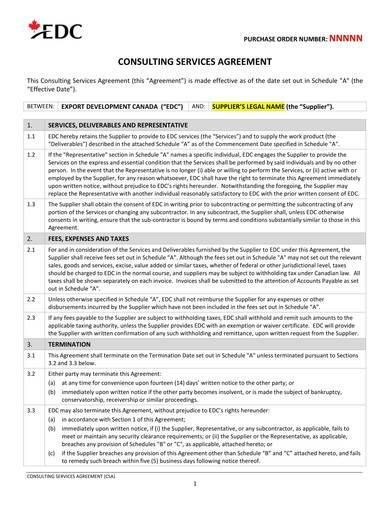 You can never go wrong if you use this general consulting services agreement sample as this has been put together by expensive legal experts. The sample has also been used for over ten years and it has proven to be effective and useful.